Socializing and training beginning when the dog or puppy first joins your house is a key element in how it will handle various situations. Puppies should learn to accept people of all ages. A trusting bond between dog and owner as well as one where the dog is responsive to the owner is very important. Even if you do not have or ever plan to have children, your dog should be used to them. Children can be threatening to dogs. Children are at eye level, have higher voices, faster motions, often forget to use gentle hands and can be unpredictable. Make sure your dog is used to various actions around him as well as sounds and smells. The more accepting your dog is of new things and the more things he is used to, the better. Children need to learn how to properly behave around dogs. Pulling ears and tails, running like crazy, teasing, hitting, cornering the dog, tormenting the dog when he is sleeping, etc., can lead to a nip or worse. Granted, dogs should learn to tolerate all body parts being touched, having food and toys taken from them and various sounds, but even the best trained dog has his limits. Many dog bites are not directly the fault of the dog but were instigated by a child. Even the best trained dog if hurt or pushed enough could bite. 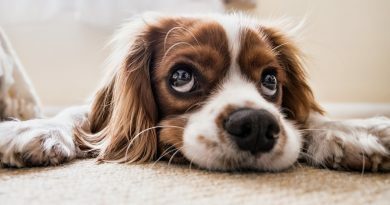 Dogs have bad days and if they are not feeling well, a pulled ear that normally would be ignored could this time end in a bite. Being with a dog is a privilege for a child. If he cannot behave, he cannot play with the dog. Always supervise children and dogs when they are together. 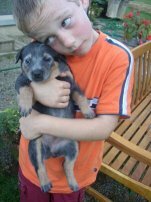 Children must learn never to go near any dog – even if it is known to the child – without permission from the owner. A dog running loose can act far differently than the same dog on lead with his owner. Dogs roaming lose are a threat to safety. Any dog that is loose should be reported to an adult. The child should never attempt to catch the dog. Some animal rescue groups even teach classes on safety around dogs. These are great to look into – even if you do not have a dog! Children should not torment dogs that are confined to the dogs’ property – this includes: running up and down fences getting dogs to chase; poking sticks at or tossing things over the fence; barking at or otherwise aggravating the dogs. Ideally, dogs should not be outside if no responsible person is home to intervene should children start to tease the pet. However, many dog owners leave their dogs out when no one is home so parents must make sure their children are behaved and know rules about dogs. A hand dangling over a fence to tease a dog is a prime target for a bite. Children must learn that dogs are feeling beings. To tease and/or hurt a dog can lead to a serious problem. Again, never leave dogs and kids unsupervised – no matter how trustworthy both are. Remember, dogs are dogs and kids are kids. Neither thinks nor rationalizes like adults do (or adults should, many children seem more adult than adults at times). Now, what if you have a dog and are expecting a child? Ideally, you should have begun to get your dog set for children long before your pregnancy. Socializing with any situation your dog could encounter at any time should start from day one. Your dog should meet and learn how to behave around children of all ages. He should get used to having his entire body touched and poked. Children will grab at ears, tails, try to peek in mouths, etc. Your dog should learn to give up any toys and food if a human puts a hand on it. Many children get nipped when they go to remove a toy from Rover or go near his food. I insist my dogs learn that humans can take food or toys from then at any time. A solid basis in obedience training is a MUST for any dog. This also helps you bond with your dog and develop a hierarchy in your house. The dog is not the chief! That role is for humans. Fido is a pack member ranking under humans. When you find out you are pregnant, you should begin getting your dog set for the new changes in the house. Granted, the concept of dog training while going through morning sickness is not top on the list of most expectant parents; however, it should be. If you know you will have to change the dog’s schedule for eating, walks, etc., start to do so long before the baby arrives. This way, the dog will not be hit with several big changes at once. Begin working on brushing up on basic commands – especially STAY and OFF. There is nothing worse than having a dog jump on you when your balance is off due to a growing belly or when holding a child. I also teach dogs to sit at the top of stairs and then go down ahead of me. I do not want them charging behind me and knocking me and/or the child over. Should you have complications with pregnancy and be confined to bed, do the best you can. Your spouse, family members, friends, etc., can all be of assistance – or even hire a dog trainer to help you out if need be. Get Scruffy used to the various sounds and smells (if possible) of a child long before yours arrives. Tape record the myriad of sounds a child makes and play them at different volumes in all rooms of the house. If you have a friend with a toddler, ask if you can use the opportunity to get your dog accustomed to the various odors and motions of a child. (Though this socializing to children should have been done when you first got your pet. However, if you suspect your dog may act aggressively, consult with a behaviorist beforehand, this will be discussed further later on). But if you can borrow clothes, etc., for short periods, do so. Babies not only sound different, but they can really smell neat! If possible, set up the nursery a month or so before the baby is due. This will give your dog time to adjust to the new room. The rule in our house is if no adult is present, no pets in the room. (In other words, when the child is napping, all critters are out). Baby gates will be your best friends here. If your dog jumps over the gates, consider installing a screen door so you can see and hear the child easily but the pets cannot get into the nursery. I just closed the door and used monitors so I could hear if my child woke. Get your dog used to doing a down/stay in the room. I allowed my dogs in while I nursed or changed my child. The rule was, the dogs had to down and stay quietly for the privilege of being in the nursery with us. Since I insisted they start doing this before our child was born, it was easier to adjust after the birth. I would sit in the rocking chair and have the dogs do down/stays next to it. Anything you want your dog to do after the baby arrives, start teaching beforehand. Trust me, there will be little time for this after the birth! Many new parents get concerned when the BIG DAY arrives. Well in advance, decide who will be responsible of caring for your dogs while the baby is being born. We had a friend lined up in case I went into labor and it would be so long as the dogs could not wait for my husband to return home. We also decided that he would not spend the first night in the hospital with us. Instead, after our child was born and we were all set, my husband would go home and tend to the dogs. Our back up was our vet who would board the dogs if need be. Luckily, my labor was five hours total. I left for the hospital at 3pm (the dogs were run, fed, pottied and brought back in first) and my husband was home shortly after midnight to care for them. My dogs were with me during the time I was in labor at home. My big guy had already learned to let me lean on him so he was great helping me get in and out of the bathroom and bed as each contraction hit. My little guy stayed right by my side and endured hands grabbing his fur suddenly. Their comfort allowed my husband to be able to pack the car and make any necessary calls. However, not all labors will be this fast and not all dogs this tolerant. Seeing you in pain can be disturbing for dogs. You are acting odd and smell different. Chances are your dog will be the last thing on your mind, but please try to remember him. In this day and age of "drive-thru" deliveries where the mother will be lucky to spend a night in the hospital (two nights if you have a great insurance plan), the old idea of bringing home a blanket the baby was wrapped in so the dogs can spend a few days getting used to the scent is difficult. My husband still did this – however, our dogs ignored the blanket. They were more interested in looking for me and then getting reassurance that all was OK. However, there are things you can do to help the transition when baby comes home. The day you are to go home, make sure the dogs get a real solid run beforehand. The dogs should be really worn out. This will help temper an over enthusiastic greeting. I also kept a couple treats they normally do not get ("moo tubes") packed away. When we got home, the first thing I did was go inside and take the dogs out back while my husband and mother brought the baby into the nursery. I played about five minutes off fetch and then brought the dogs in and gave them their treats. I went upstairs to the nursery. As each dog finished, he came to find me. I sat on the floor and had each dog do a down/stay. My husband was holding the baby. Each dog got to greet the new addition gently. This way, the dogs were not hit with everything at once and they had a transition between greeting me and meeting the baby. As I took a nap, my husband took everyone out for more playing. My mother was in town for the week and this gave me time to work with the dogs and reinforce the prior training in nursery rules while Mom helped with the house. I like to make it a point to allow the dogs access to all aspect of raising the child. They could be with me while I nursed as long as they were quietly on a down/stay. They could watch diapers being changed as long as they were calm and quiet. Same for when we were all just hanging out on the bed napping. When my son napped, I would spend alone time with the dogs before I napped. Making sure the dogs get one-on-one time without the baby is very important. You want to keep that bond with your dogs but also enforce that child will be higher on the pack rank than the dog. Baby is not a bad thing but a welcome addition and there will still be time for the dog. However, safety is always first and no matter how well trained and socialized your dog is, never leave him unattended with an infant or child. As the baby grows, use the opportunity to teach the child "Gentle Hands." I started showing my son how to gently touch the dogs and not to grab as soon as I could. Waiting until the child is a toddler to try and start teaching Gentle Hands can be too late. Babies start to grab and poke and even hit at a young age. 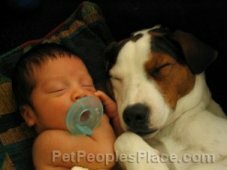 They need the same gentle love and guidance as you used when getting your dog set for the new arrival. I found it is far easier to teach a child what you expect from the beginning than it is to change the rules midstream! At two, my son helps me feed the dogs, aids in bathing (his is Soap Man!) and is learning how to gently brush them. He is a far cry from a former neighbor’s toddler who would grab their dog so hard that the dog would snap. No one taught either dog or child proper behavior. This was a serious accident waiting to happen. Already, they had gotten rid of one dog as opposed to training the dog and their children. With work and luck, your dog and child will grow to be a wonderful team, but not all parents are so lucky. Should you notice your dog acting dominant, snapping at or even biting the child and the child has done nothing to provoke it, seek professional help. Even if the child did provoke it, the dog must learn that biting is not acceptable and to walk away. Should there be ANY question in your mind at all about your dog’s response to your child, seek professional help immediately. If your dog is known to be aggressive before you have children, seek help long before you have a child. An ounce of prevention is worth a pound of cure. 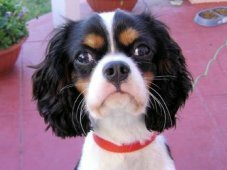 Make certain you do all you can long before pregnancy to prepare your dog for children – is far easier than fixing a problem allowed to go on too long. Even if you do not have children of your own, your dog must be accepting of them. Insist that all children around your dog know the rules and follow them. I have banned children from visiting my dogs since they repeatedly refused to follow the rules. Children will be children and forget, but rules must be followed or they will not have the privilege of visiting my dogs. Safety for child and dog is always first priority! Dogs and kids can be the best or the worst matches. Timmy and Lassie are not reality. However, there is no reason why your dog and you child cannot coexists happily if you are a responsible dog owner and parent. The worst thing for a dog is to be banished or ignored when a child is born. Many dogs will die in shelters when a new baby arrives. 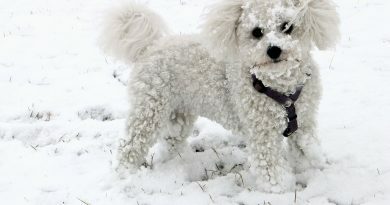 With planning and forethought on the part of dog owners, this need not happen.